Management of this condition can be challenging, especially in chronic cases. • CSC is an idiopathic condition, the pathophysiology of which is poorly understood, but several possible vascular causes have been proposed. • Focal laser and PDT are current standards of care for chronic CSC, but micropulse laser is a good alternative in instances in which verteporfin is not available. • Some systemic treatments may benefit patients with chronic CSC. This article reviews some of the basics about this condition, including associated risks, pathophysiology, and available treatment options. Given the strong association between CSC and steroids, their use should be avoided whenever possible. Furthermore, patients with CSC should be questioned about their use of all forms of steroids, including products that may contain steroids (eg, skin creams, joint injections, nasal sprays, inhalants, and other commonly overlooked forms of glucocorticoid), as these could be contributing factors. In 2013, Warrow et al reported a series of patients with RPE changes in one or both eyes that resembled those frequently seen in the fellow eyes of patients with unilateral CSC.17 The authors suggested that these RPE changes occurred in the absence of serous detachment but were related to a spectrum of choroidal abnormalities seen typically in CSC eyes. The term pachychoroid pigment epitheliopathy (PPE) was introduced to describe this entity, which these authors considered to be a forme fruste of CSC. En face OCT imaging in a cohort of patients with pachychoroid disease revealed that focal choroidal thickening could be attributed to pathologically dilated Haller layer veins (referred to as pachyvessels), and, where tissue manifestations occurred at the level of the RPE, paradoxical thinning of the inner choroid (choriocapillaris and Sattler layer) could be appreciated, resulting in anterior displacement of pachyvessels into close proximity to Bruch membrane. Acute CSC is typically a self-limited process. Recovery of visual acuity typically occurs within 1 to 4 months, coinciding with reattachment of the neurosensory retina, with few recognized visual sequelae.24 Recurrences are common, happening in approximately 30% to 50% of patients by 1 year.25 Patients with frequent recurrences or with chronic neurosensory retinal detachment may develop RPE atrophy and neurosensory retinal changes that result in permanent loss of functional vision. The terms acute and chronic (fluid persisting > 3 months) will be used in this discussion. Observation is the standard initial management in patients with acute CSC, but there are instances when treatment may be desirable. These instances include CSC with persistent macular subretinal fluid (SRF) or reduced visual acuity, cases in which rapid recovery of vision is required for vocational reasons, and those in which untreated CSC has resulted in a poor visual outcome in the fellow eye. Focal laser photocoagulation is commonly used to expedite SRF absorption in acute and chronic CSC. Typically, laser burns are applied to areas of focal leakage identified by fluorescein angiography (FA) as the principal sources of SRF.26 Treatment of these leaks usually leads to SRF resolution; however, in rare instances, laser photocoagulation may be associated with persistent scotoma at the site of photocoagulation and choroidal neovascularization (CNV). Thus, laser photocoagulation is not recommended if the point of leakage is within or near the foveal avascular zone. Other types of laser delivery may also be efficacious in treatment of CSC. Micropulse laser delivery mode (Figure) diminishes the risk of iatrogenic thermal damage because it does not induce visible laser burns and can therefore be used to treat subfoveal or juxtafoveal focal and diffuse leaks.27 Photodynamic therapy (PDT) with the light-activated drug verteporfin (Visudyne, Bausch + Lomb) has been effectively used to treat chronic CSC.28 Potential advantages of micropulse laser over PDT include lower cost and no adverse events associated with PDT infusion (eg, transient reduction in macular function, choroidal nonperfusion, RPE atrophy, and CNV). Figure. The left eye of a patient with CSC before (top images) and after (bottom images) micropulse laser treatment. 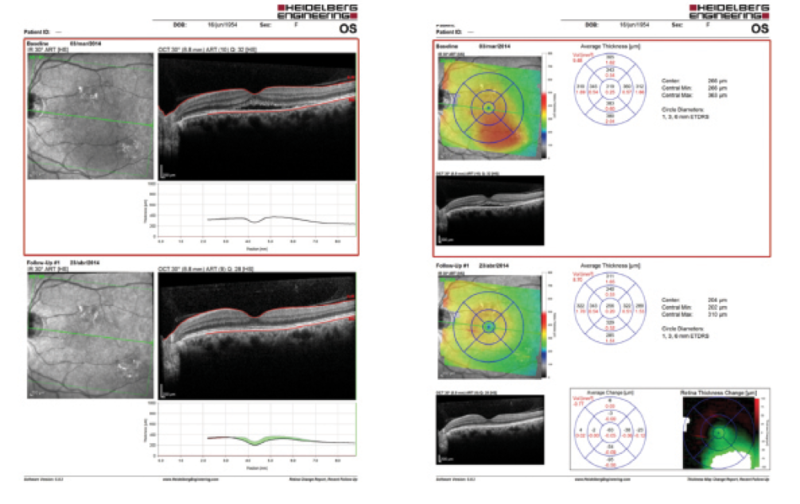 The subretinal fluid disappeared quickly after treatment, and the external retinal layers normalized within a few weeks. Roca et al conducted a multicenter retrospective comparative study of 159 consecutive eyes with chronic CSC treated with either yellow micropulse laser or half-dose verteporfin PDT.29 The main outcome measures were BCVA and central macular thickness (CMT) at 12 months. A probability value of less than .05 was considered statistically significant. Advances in imaging techniques have improved our understanding of the choroid and choroidal disorders. Management of CSC is challenging, particularly chronic CSC. Although focal laser and PDT are current standards of care in chronic CSC, micropulse laser is a good alternative in instances when verteporfin is not available. Some systemic treatments may benefit patients with chronic CSC by decreasing the rate of therapy-induced complications. 2. Haimovici R, Koh S, Gagnon DR, et al; Central Serous Chorioretinopathy Case-Control Study Group. Risk factors for central serous chorioretinopathy: a case-control study. Ophthalmology. 2004;111(2):244-249. 3. Tittl MK, Spaide RF, Wong, et al. Systemic findings associated with central serous chorioretinopathy. Am J Ophthalmol. 1999;128(1):63-68. 4. Bouzas EA, Scott MH, Mastorakos G, et al. Central serous chorioretinopathy in endogenous hypercortisolism. Arch Ophthalmol. 1993;111(9):1229-1233. 5. Cousins L, Rigg L, Hollingsworth D, et al. Qualitative and quantitative assessment of the circadian rhythm of cortisol in pregnancy. Am J Obstet Gynecol. 1983;145(4):411-416. 6. Chumbley LC, Frank RN. Central serous retinopathy and pregnancy. Am J Ophthalmol. 1974;77(2):158-160. 7. Yannuzzi LA. Type A behavior and central serous chorioretinopathy. Trans Am Ophthalmol Soc. 1986;84:799-845. 8. Michael JC, Pak J, Pulido J, de Venecia G. Central serous chorioretinopathy associated with administration of sympathomimetic agents. Am J Ophthalmol. 2003;136(1):182-185. 9. Mansuetta CC, Mason JO 3rd, Swanner J, et al. An association between central serous chorioretinopathy and gastroesophageal reflux disease. Am J Ophthalmol. 2004;137(6):1096-100. 10. Gemenetzi M, De Salvo G, Lotery AJ. Central serous chorioretinopathy: an update on pathogenesis and treatment. Eye (Lond). 2010;24(12):1743-1756. 11. Guyer DR, Yannuzzi LA, Slakter JS, Sorenson AJ, Ho A, Orlock D. Digital indocyanine green videoangiography of central serous chorioretinopathy. Arch Ophthalmol. 1994;112(8):1057-1062. 12. Spitznas M. Pathogenesis of central serous chorioretinopathy: a new working hypothesis. Graefes Arch Clin Exp Ophthalmol. 1986;224(4):321-324. 13. Potsaid B, Baumann B, Huang D, et al. Ultrahigh speed 1050nm swept source/Fourier domain OCT retinal and anterior segment imaging at 100,000 to 400,000 axial scans per second. Opt Express. 2010;18(19):20029-20048. 14. Spaide RF, Koizumi H, Pozzoni MC. Enhanced depth imaging spectral-domain optical coherence tomography. Am J Ophthalmol. 2008;146(4):496-500. 15. Spaide RF, Hall L, Haas A, et al. Indocyanine green videoangiography of older patients with central serous chorioretinopathy. Retina. 1996;16(3):203-213. 16. Imamura Y, Fujiwara T, Margolis R, et al. Enhanced depth imaging optical coherence tomography of the choroid in central serous chorioretinopathy. Retina. 2009;29(10):1469-1473. 17. Warrow DJ, Hoang QV, Freund KB. Pachychoroid pigment epitheliopathy. Retina. 2013;33(8):1659-1672. 18. Chung H, Byeon SH, Freund KB. Focal choroidal excavation and its association with pachychoroid spectrum disorders: a review of the literature and multimodal imaging findings. Retina. 2017;37(2):199-221. 19. Pang CE, Freund KB. Pachychoroid neovasculopathy. 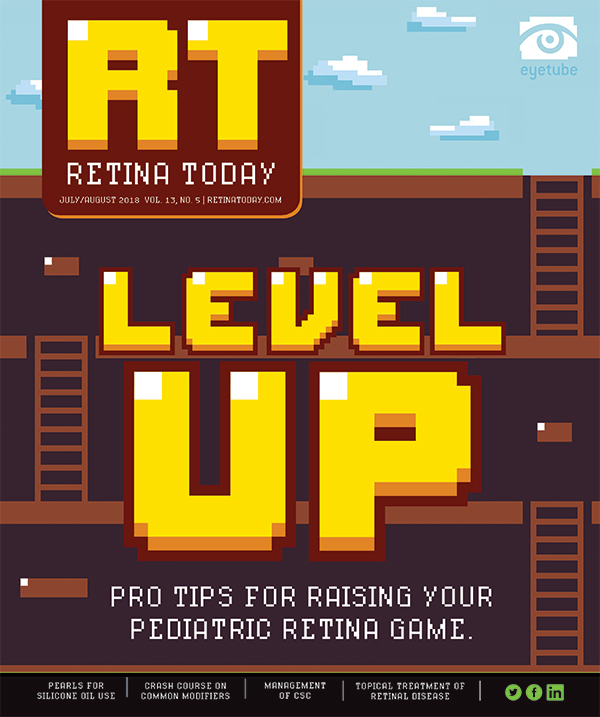 Retina. 2015;35(1):1-9. 20. Dansingani KK, Balaratnasingam C, Naysan J, Freund KB. En face imaging of pachychoroid spectrum disorders with swept-source optical coherence tomography. Retina. 2016;36(3):499-516. 21. Gal-Or O, Dansingani KK, Sebrow D, Dolz-Marco R, Freund KB. Inner choroidal flow signal attenuation in pachychoroid disease: optical coherence tomography angiography [published online ahead of print January 30, 2018]. Retina. 22. Weenink AC, Borsje RA, Oosterhuis JA. Familial chronic central serous chorioretinopathy. Ophthalmologica. 2001;215(3):183-187. 23. Lehmann M, Bousquet E, Beydoun T, et al. Pachychoroid: an inherited condition? Retina. 2015;35(1):10-16. 24. Klein ML, Van Buskirk EM, Friedman E, et al. Experience with nontreatment of central serous choroidopathy. Arch Ophthalmol. 1974;91(4):247-250. 25. Loo RH, Scott IU, Flynn HW Jr, et al. Factors associated with reduced visual acuity during long-term follow-up of patients with idiopathic central serous chorioretinopathy. Retina. 2002;22:19-24. 26. Nicholson B, Noble J, Forooghian F, et al. Central serous chorioretinopathy: update on pathophysiology and treatment. Surv Ophthalmol. 2013;58(2)103-126. 27. Sivaprasad S, Elagouz M, McHugh D, et al. Micropulsed diode laser therapy: evolution and clinical applications. Surv Ophthalmol. 2010;55(6):516-530. 28. Yannuzzi LA, Slakter JS, Gross NE, et al. Indocyanine green angiography-guided photodynamic therapy for treatment of chronic central serous chorioretinopathy: a pilot study. Retina. 2003;23(3):288-298. 29. Roca JA, Wu L, Fromow-Guerra J et al. Yellow (577 nm) micropulse laser versus half-dose verteporfin photodynamic therapy in eyes with chronic central serous chorioretinopathy: results of the Pan-American Collaborative Retina Study (PACORES) Group [published online ahead of print February 8, 2018]. Br J Ophthalmol. 30. Delyani JA. Mineralocorticoid receptor antagonists: the evolution of utility and pharmacology. Kidney Int. 2000;57(4):1408-1411. 31. Bousquet E, Beydoun T, Rothschild PR, Bergin C, et al. Spironolactone for nonresolving central serous chorioretinopathy: a randomized controlled crossover study. Retina. 2015;35(12):2505-2515. 32. Schwartz R, Habot-Wilner Z, Martinez MR, et al. Eplerenone for chronic central serous chorioretinopathy-a randomized controlled prospective study. Acta Ophthalmol. 2017;95(7):e610-e618. 33. Gramajo AL, Marquez GE, Torres VE, Juárez CP, Rosenstein RE, Luna JD. Therapeutic benefit of melatonin in refractory central serous chorioretinopathy. Eye (Lond). 2015;29(8):1036-1045.